In April, ESA’s stellar surveyor Gaia released an unprecedented catalogue of more than one billion stars. Astronomers across the world have been working ceaselessly over the past few months to explore this extraordinary dataset, scrutinising the properties and motions of stars in our Galaxy and beyond with never before achieved precision, giving rise to a multitude of new and intriguing studies. The Milky Way contains over a hundred billion stars. Most are located in a disc with a dense, bulging centre, at the middle of which is a supermassive black hole. The rest are spread out in a much larger spherical halo. Stars circle around the Milky Way at hundreds of kilometres per second, and their motions contain a wealth of information about the past history of the Galaxy. The fastest class of stars in our Galaxy are called hypervelocity stars, which are thought to start their life near the Galactic centre to be later flung towards the edge of the Milky Way via interactions with the black hole. 1) Note that the 13 stars in orange are all very close to the plane of the Milky Way; stars from other galaxIES should be coming in from all directions like Oort Cloud comets. 2) Also, Oort Cloud comets represent a minuscule fraction of the Oort Cloud with virtually no angular momentum; stars from another galaxy would also represent a minuscule fraction of "free range" stars that have virtually no angular momentum. Ve = Vc SQRT[2 + 2 ln(Rmax/R☉)]; this could be many times larger than Vc. Hence, all 13 stars in orange are probably returning Milky Way stars that couldn't achieve escape velocity. 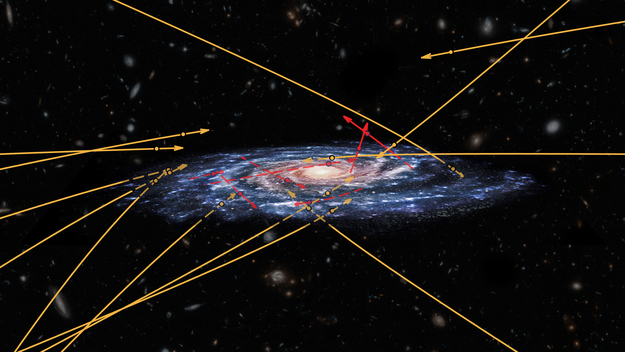 Even at hyper velocity, aren't the distances between galaxies so great that only stars from relatively close members of our Local Group could have had enough time to reach the Milky Way? These stars have velocities <700 km/s while the (local) Milky Way escape velocity is >500km/s. which would restrict them to the Local Group.